Well, I’m back in Austin now. 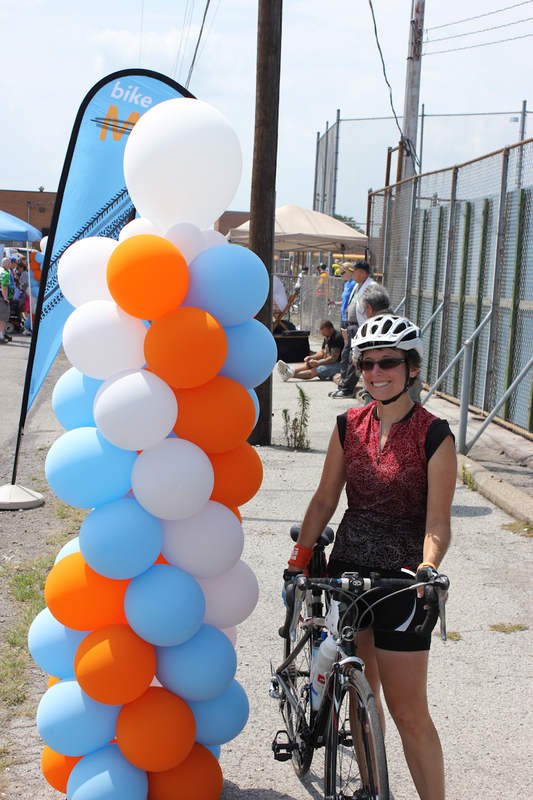 This past weekend I rode the 2012 BikeMS: Pedal to the Point in northern Ohio. 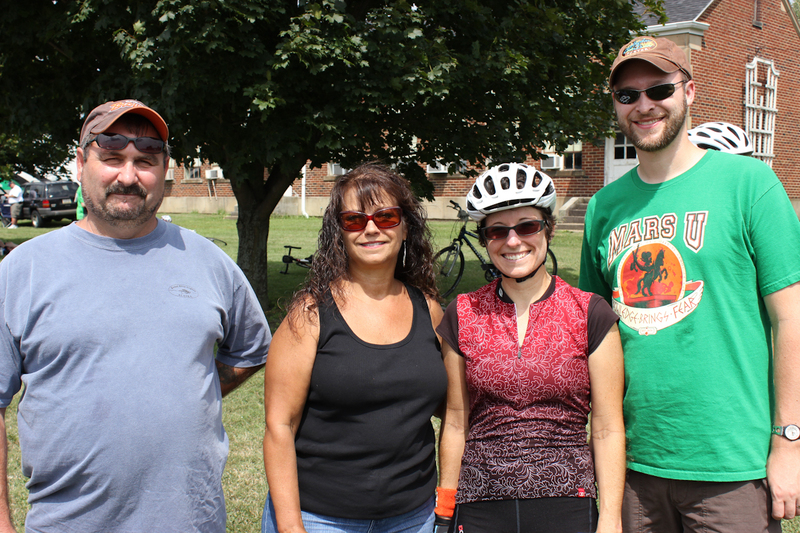 The route goes from Brunswick to Sandusky, Ohio and back again. I had a great time while I was there, spending time with my family and some close friends that I don’t see nearly often enough. 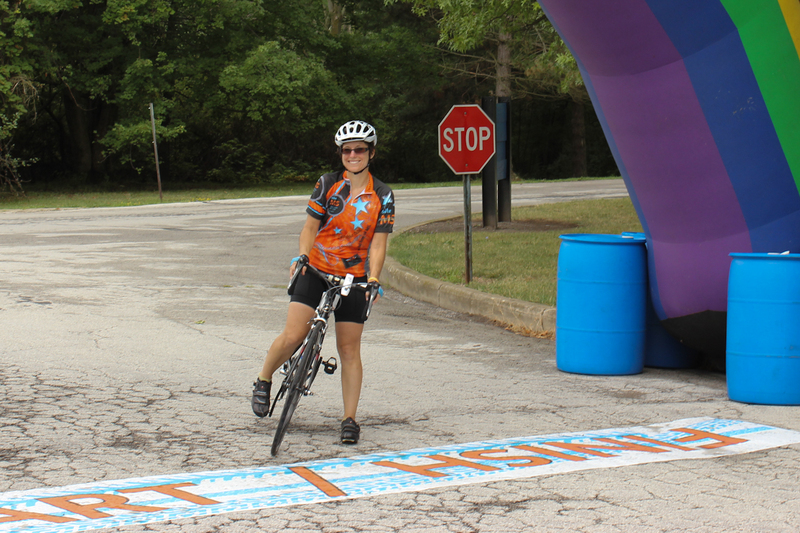 This was my 5th year riding in a BikeMS event. So far this year, I’ve raised $1,110 for the MS Society (it’s not too late to donate). 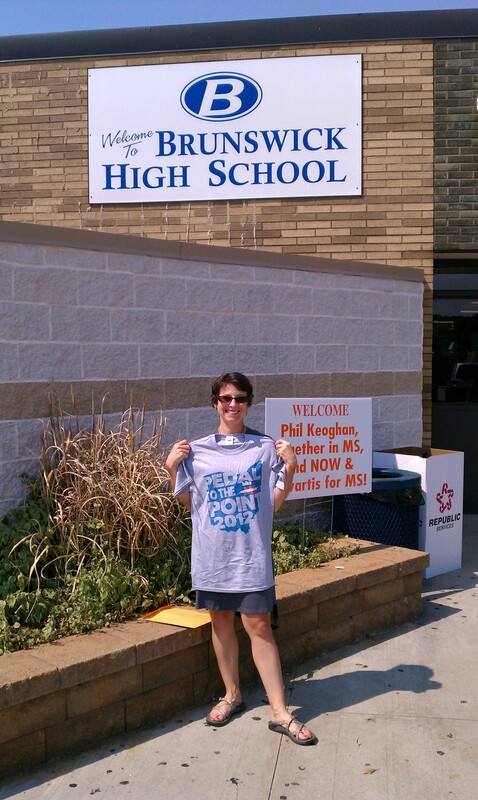 During the ride, I rode through my old high school stomping grounds. In fact, I even rode by the houses of my two closest high school friends. Overall, the ride was nice although it lacked some of the excitement of the BP MS 150 from Houston to Austin and the Escape to the Lake in western Pennsylvania. The lack of excitement was made up by having a great crew of supporters see me off at the start line, meet me at rest stops, and cheer for me at the finish. 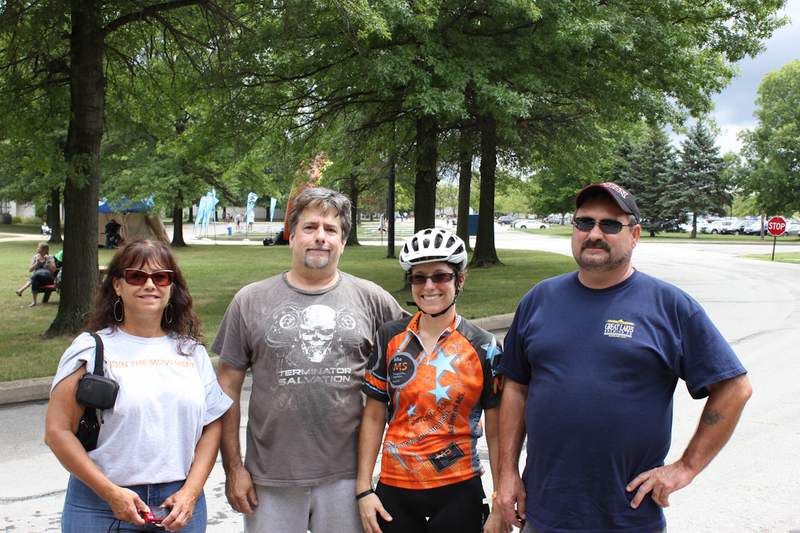 Throughout the ride I got to spend time with my wonderful husband Carl who accompanied me to Ohio, my Mom & Darrell, my Dad & Ellen, and my Uncle Jim. We arrived in Cleveland late Wednesday night after a delayed flight in Austin almost made us miss our connection in DFW. By some miracle, our checked luggage actually made it on the plane and showed up in Cleveland with us. Last year on my BikeMS trip, the same situation was much worse when I was without my luggage for more than 24 hours after landing. Thursday my bike was delivered to a FedEx office so we picked it up and I assembled it. Need to transport large things? 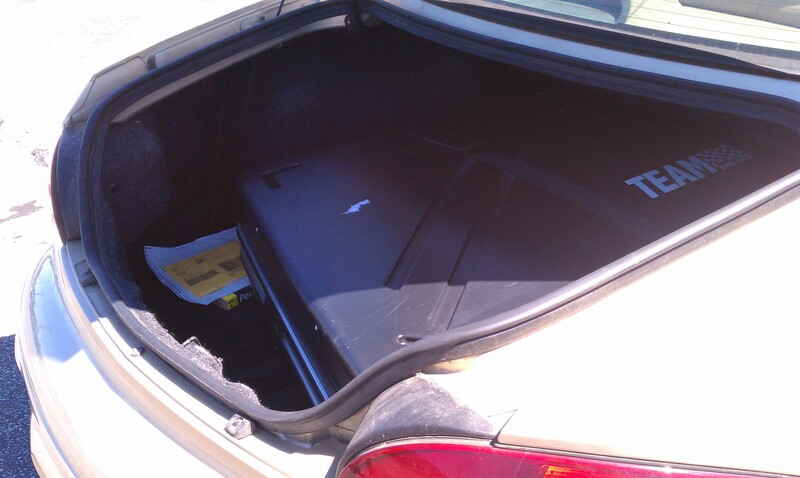 The trunk of a ’99 Chrysler Concord swallowed up the large bike case with room to spare. Yep, the bike parts were all still in the case upon arriving in Ohio. 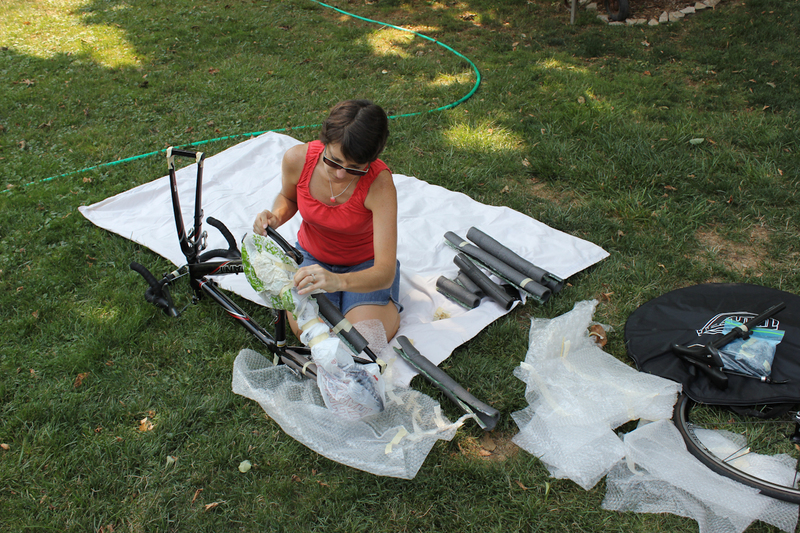 Unpacking and assembling my bike. Thursday evening we enjoyed a nice dinner and a few beers at Great Lakes Brewing Company in Cleveland with my Dad & Ellen. Carl and I try to make it to the Brewery at least once during every Ohio visit. I even picked up a new bike jersey in the gift shop while we were there. Friday afternoon we headed to packet pickup in Brunswick where I got my rider numbers, route map, and t-shirt. Friday evening we enjoyed a smorgasbord of fresh Ohio food including amazing tomatoes and cucumbers from my Mom’s garden and sweet corn from a local farm. The company was great as three friends and their families joined us for a cookout and some relaxation the evening before my ride. Bright and early on Saturday morning my Mom and Carl drove me out to the start line in Brunswick. We rolled out at 7:20 am after a delay while the organizers were waiting for the ride celebrity, Phil Keoghan from the Amazing Race, to make the opening remarks. Waiting for Phil Keoghan at the start line. 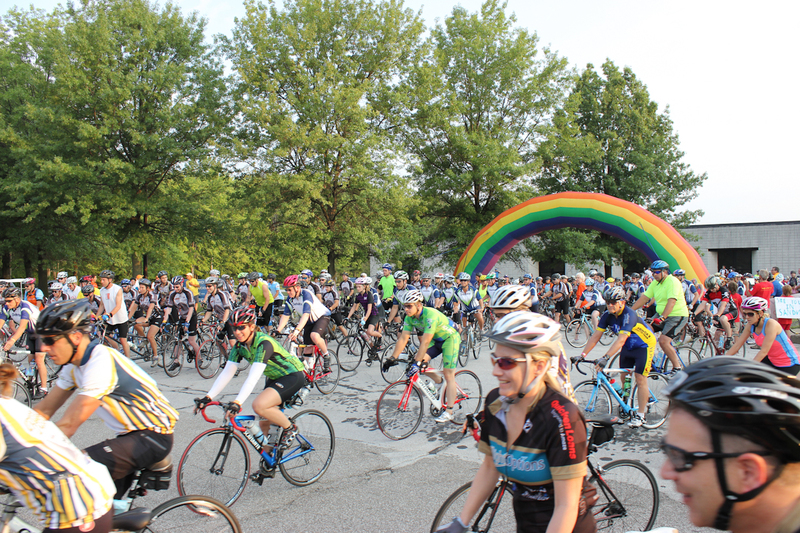 A mass of riders pouring out of the start line. On Saturday, the weather was quite nice, if a bit on the hot side for Ohio. I was ok with the heat. The route only had a few hills, although some of them were steep, none of them lasted for very long. A few roads had more traffic than I expected but I didn’t encounter any angry drivers. In fact, a few times drivers gave me a thumbs-up as they went by. As always, I rode the extra loop so that Saturday would be a 100 mile ride. The extra loop was called the “Kent Clapp Extra Lap” in honor of Kent Clapp, CEO of Medical Mutual of Ohio, who died in a chartered plane crash in December 2009, along with his fiancé. 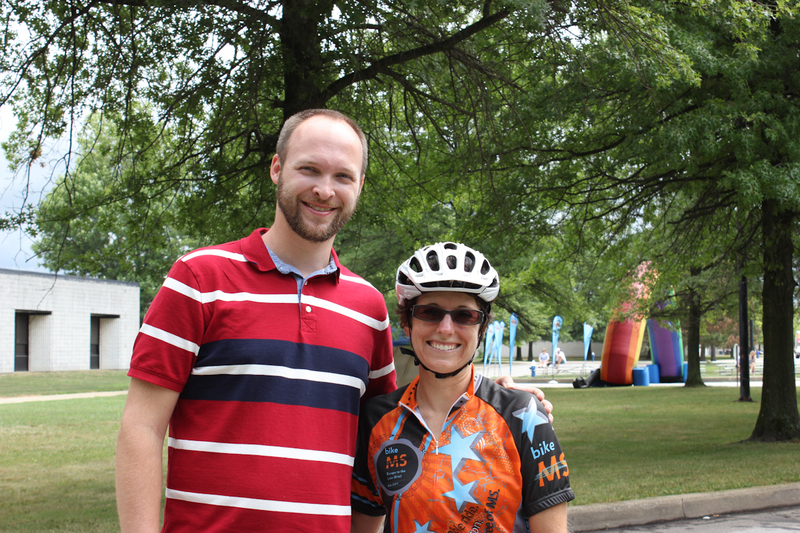 Medical Mutual has been sponsoring a BikeMS team since 2008. My first rest stop of the day was at mile 40 on the extra lap. I received a wrist band indicating the extra distance I rode. Carl, Mom, and Darrell met me at the rest stop. 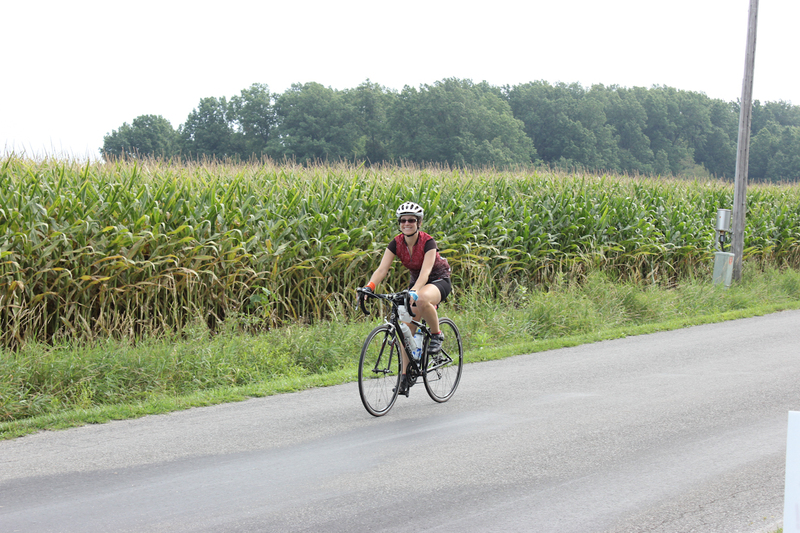 Riding out of my first rest stop, in front of a field of corn. 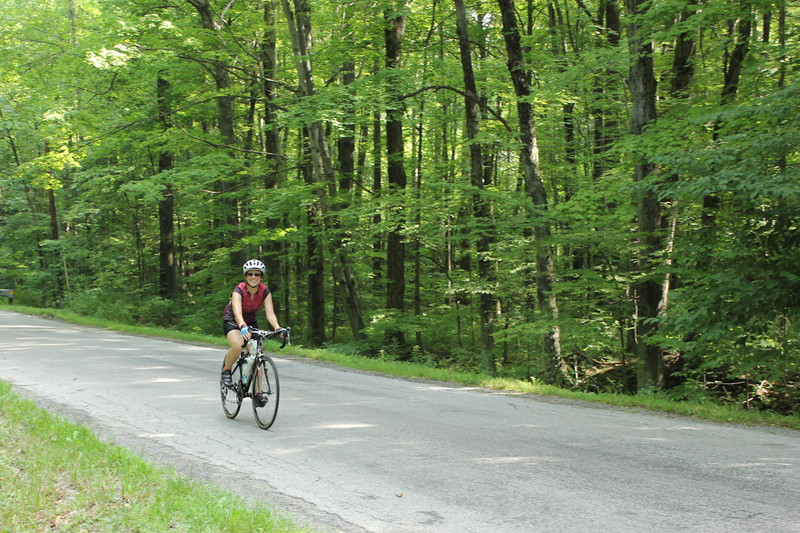 My photo crew hid out a few miles from the rest stop and snapped my photo as I rode through a tunnel of trees. Seen on my bike: Scenic Ohio back road with wildflowers. I proceeded to ride through many roads extremely familiar to me, even going by houses of friends from high school as we cut across Lagrange, Ohio, my hometown for a number of years. 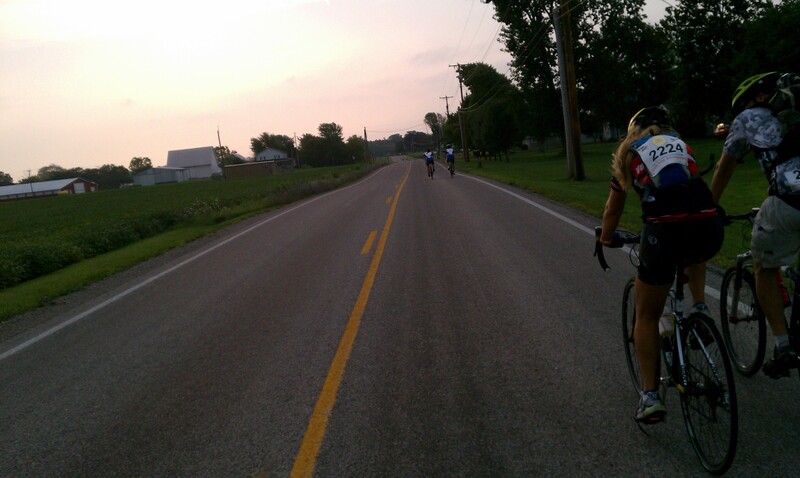 During this section, I got caught up in a friendly pace group and was making great time. I lost them at the lunch stop because I continued to the next rest stop where my crew was waiting for me again. Mom and I in the line for water. One thing disappointing about this ride was the rest stops. They only had two water stations and so long lines would form as cyclists waited to get water. Besides a good fruit selection, the snacks at the rest stops were mostly unhealthy and not something I would eat while riding a bike. My rest stop supporters. They even brought me pretzels and a pickle! Seen on my bike: Old bridge. The ride was a little tough-going after that stop. I was hot and tired and the wind had picked up. 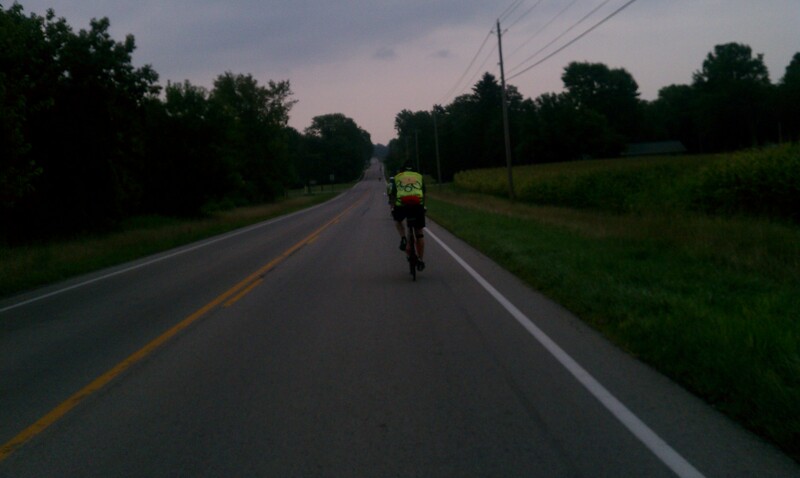 I was mostly passing people because I had caught up with the folks riding the shorter route. 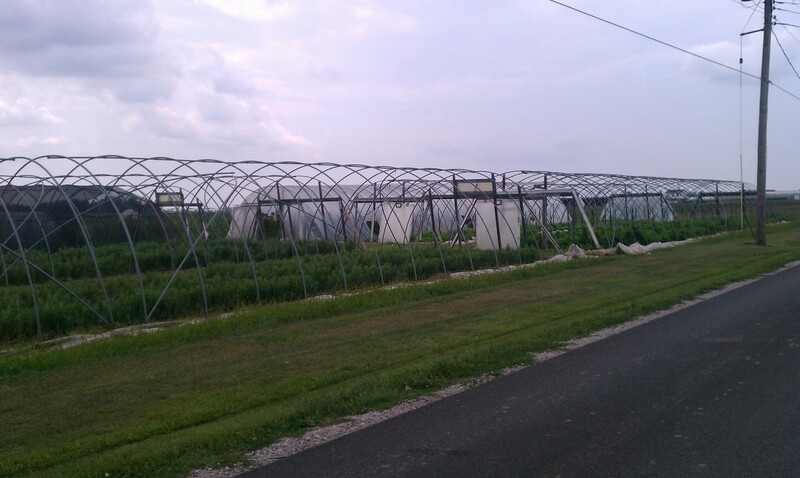 Seen on my bike: Large greenhouse out in the country. 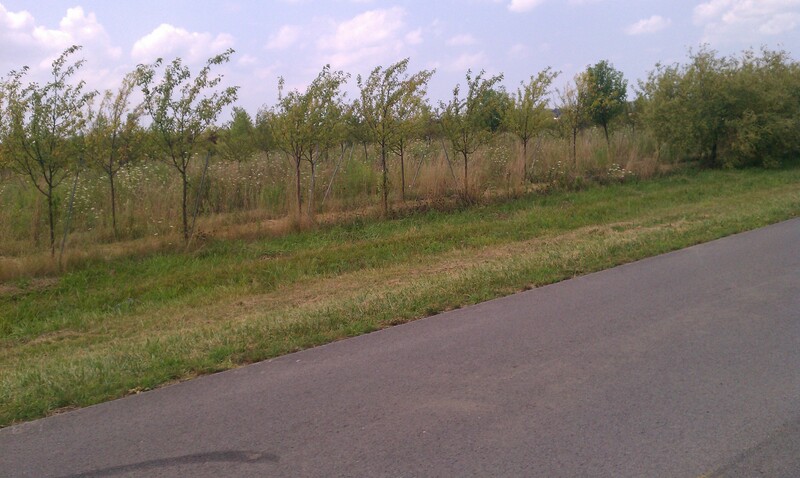 Seen on my bike: Fruit orchard! I eventually reached the finish line for Saturday after riding 101 miles. The finish line was marked with blue flags and balloons and loud music. 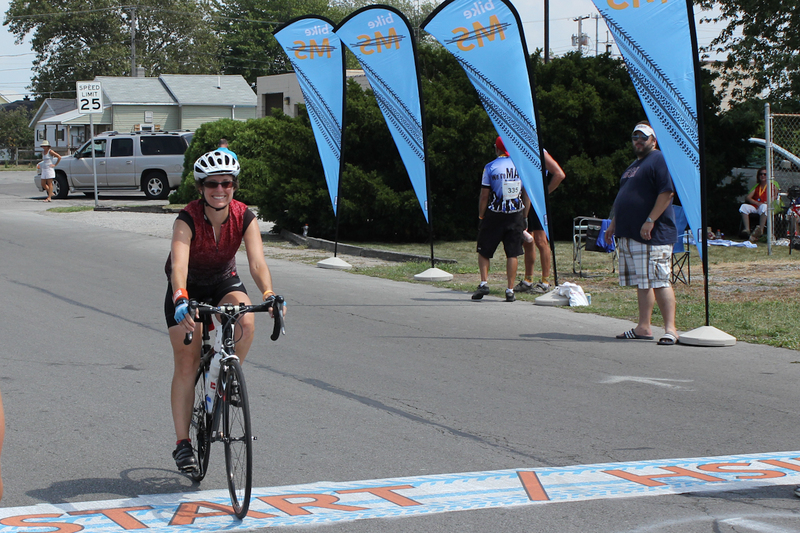 Riding across the finish line on Saturday! Saturday evening we stayed in little camping cabins with my Dad and Ellen only a few miles away from the finish line. We had dinner and drinks at Mon Ami winery, which was quite good. I knew from the start that Sunday’s forecast was for an 80% chance of thunderstorms. We were surprised when the storms started around 8:30 pm Saturday evening. The wind picked up and there was a lot of thunder and lightening while we hunkered down in the cabins. It rained, but it was by no means a torrential downpour, thankfully. Sunday morning I woke bright and early and checked the weather map. There didn’t appear to be any rain in sight although the forecast still said 80% chance of rain. I was hopeful that by putting my rain jacket in my jersey pocket I would deter the rain. 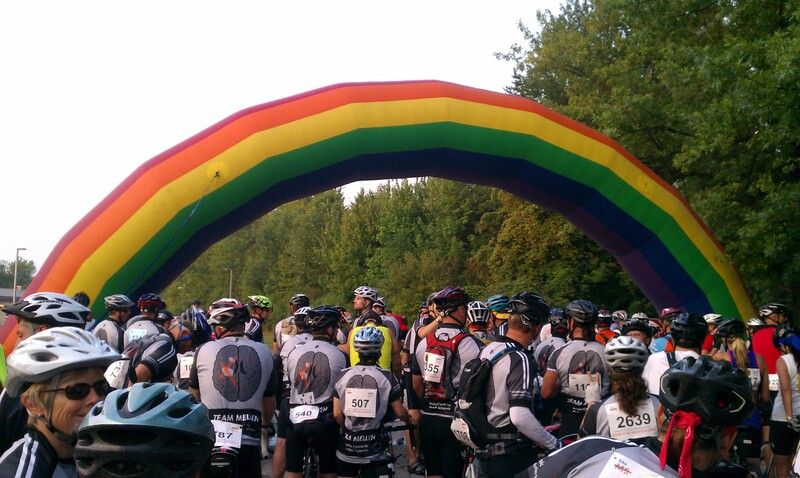 We loaded my bike up into the truck, drove the to start line and I joined the route right at 7 am. It was a nice morning, if a bit damp and windy. I got caught up in an extremely fast pace group for a while which helped me reach my first planned stop at mile 30 at a small park in Wakeman, Ohio rather quickly. By then I knew I was most likely going to get rained on. There were very dark clouds behind me so I was just trying to ride out in front of the clouds as fast as I could. 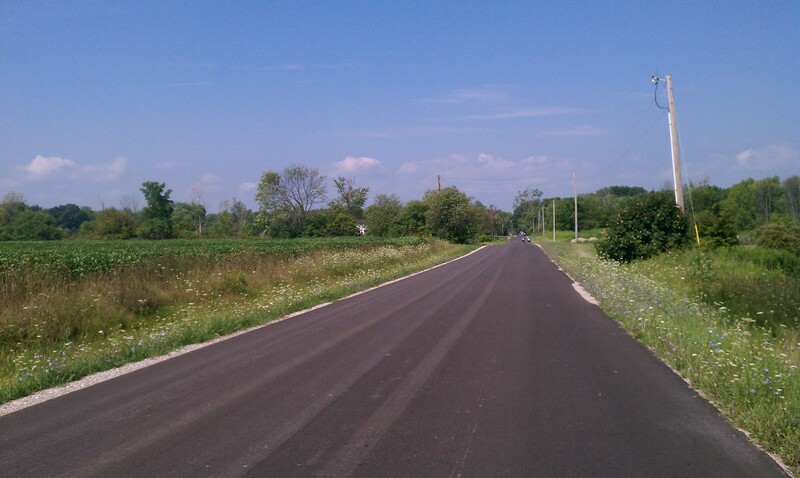 Seen on the bike: Sunday morning country road. I was near these two riders for a while both on Saturday and Sunday. 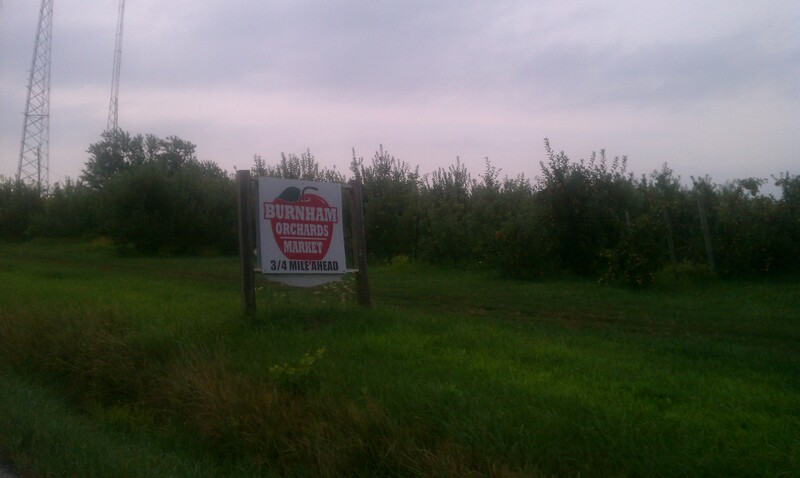 Seen on the bike: Apple orchard and a gloomy sky. Soon after the rest stop, I picked up yet another pace group who invited me to join them as they tried to out run the rain. Unfortunately that did not work and soon a steady rain began. I never saw lightening thankfully. There was wind but it wasn’t terrible and the rain was not so heavy that we couldn’t ride in it. 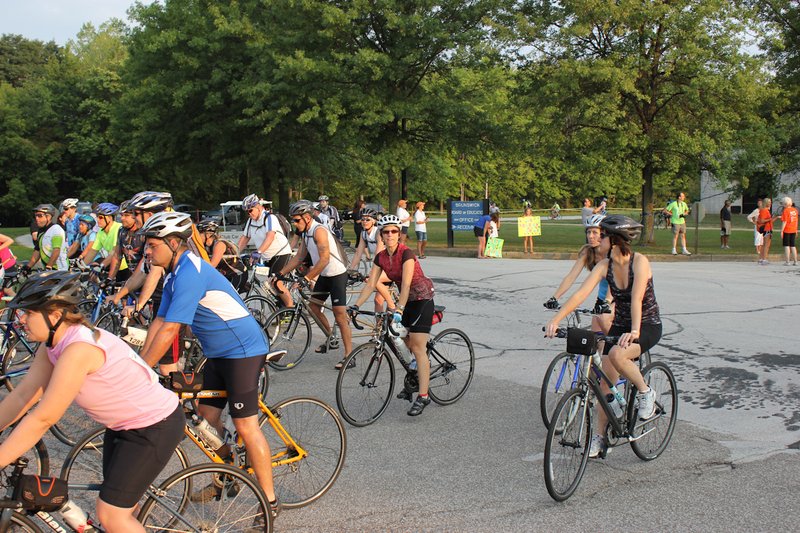 However, I did start to see a number of bike crashes mostly from people riding in groups. Once your wheels are wet, your brakes don’t work well at all and you have to be very careful. If you need to brake in a group I can see how this would lead to a crash. I was thankful that after riding by the lunch stop most of the groups of riders stopped and I was on my own on the route. Not that I entirely wanted to ride alone, but I was nervous about crashing. 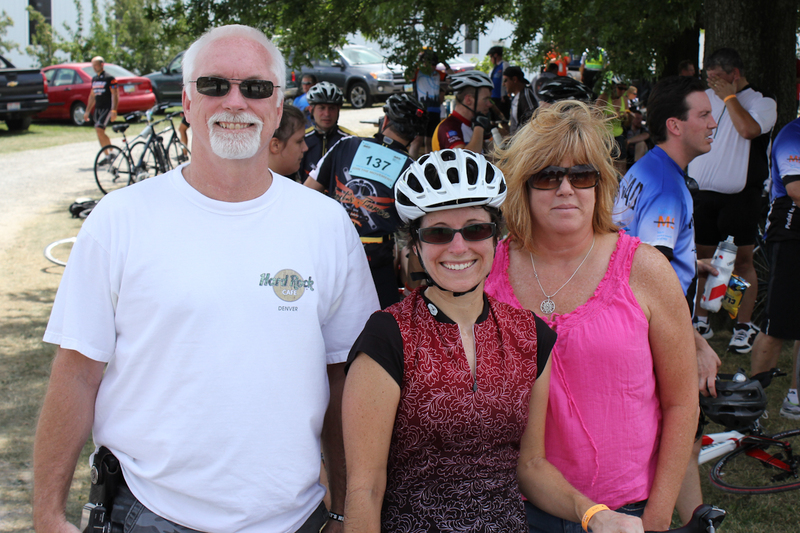 At my next rest stop I was met by my Mom, Darrell, and my uncle who made the trip in from Pennsylvania to see me. By that time I was drenched. My Mom was volunteering at the stop which was near her house. They had plenty of volunteers so after I stopped she headed for the finish to see me there. Seen on the bike: I saw rider #1 on both Saturday and Sunday. On Sunday he was sporting a top VIP fundraiser jersey which was pretty awesome. On Saturday, he was riding with a young teenage rider, showing her the ropes of the ride. While the rain relented for a while, it picked up again after the rest stop. The rain stopped again closer to the finish. The last 10 miles or so of the route felt like some sort of punishment. First we turned straight south into a nasty headwind for a number of miles. Then we turned out of the headwind going east and went up a loooooonnnnngggg slow hill capped with a short steep segment where a few other riders were walking their bikes. We then turned onto a road in desperate need of repair. Constant potholes, many of them large enough to put your tire in, were quite scary. It was like navigating a maze. Eventually I turned off into the smooth school grounds and ended up at the finish line with my cheering section. I rode 84 miles. Cheering section at the finish line! The finish was largely absent of spectators. I’m not sure if I was just early or if this ride just doesn’t get many spectators. Definitely different from my previous four BikeMS events. 2008 BP MS150: No rain! 2010 BPMS150: Big storm Saturday night left me unable to sleep. Sunday was misty and the lack of sleep greatly affected my ride. 2011 Escape to the Lake: Threatened rain Saturday. It started as soon as I crossed the finish. Rain overnight and Sunday was cold and misty on the bike. 2012 Pedal to the Point: Saturday night rain, steady rain on Sunday. I had a great ride both days despite the rain and really enjoyed the route. I think I had a smile on my face for the majority of Saturday’s ride because it was so nice to ride in areas familiar while knowing that loved ones were cheering me on. 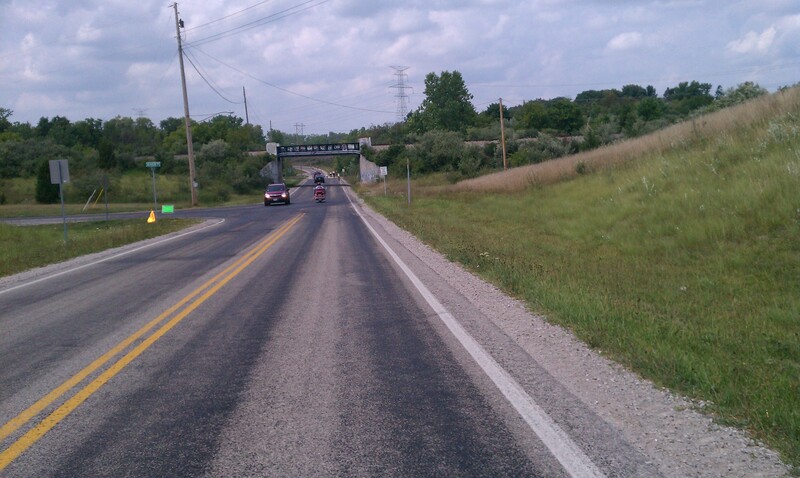 I know that you were thinking of me and most likely saw my Facebook and Twitter updates for the ride. Your support is greatly appreciated! I’m so thankful to have such generous family and friends. If you’d like to donate, there’s still time! Head over to my fundraising page.